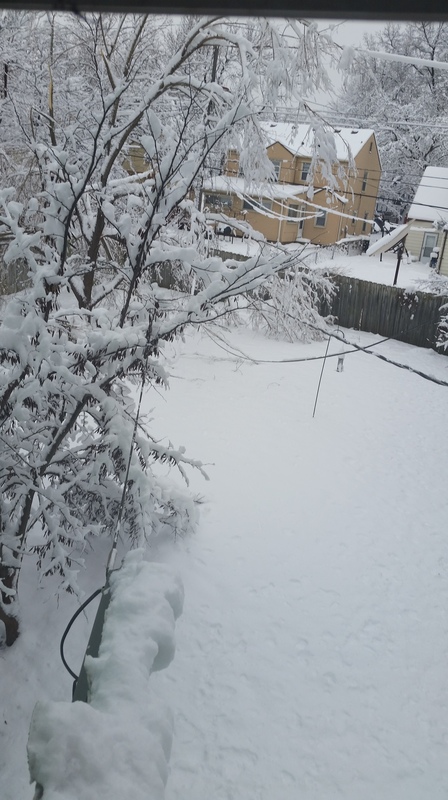 A blogging friend, Rambling Rose, asked me to write a post on our debilitating winter storm. She wrote, “We in the tropics only hear about such weather on news channels.” Ah, to be so fortunate. Although I have lived in the tropics from time to time, I do not now. Now I live in the middle of the Continental United States which is prone to storms of magnitude and ferocity. This is what two days of a winter storm of magnitude and ferocity looks like. It began on a Friday night. And actually, was quite beautiful. The forecast had said it would begin with light rain turning to ice. It did. The shiny streaks are the ice crystals, picking up light as they fall. We brought in stacks of firewood and lighted a fire. Watched television, especially the weather channel, looked outside from time to time. The ice crystals finally turned to snowflakes but there was no wind so we went to bed. We slept soundly under our feather comfort, sort of like Mr. and Mrs. Claus at the North Pole after the Christmas Eve run. We did hear a thump in the night and got up to see what it was. Between snow and dark, we couldn’t tell but the thump seemed to come from upstairs. Not a good sound. The last time we heard a thump in the house signaled a complete attic to basement rewire. The next morning was still and silent. It had snowed all night. No wind. Just snow and snow and snow. In early light, at my upstairs window where I sit each morning, I discovered the thump. If you look at the bottom left corner, you will see a lump of snow sort of lying on something. That something turned out to be our window sill, pulled loose by the weight of the snow. 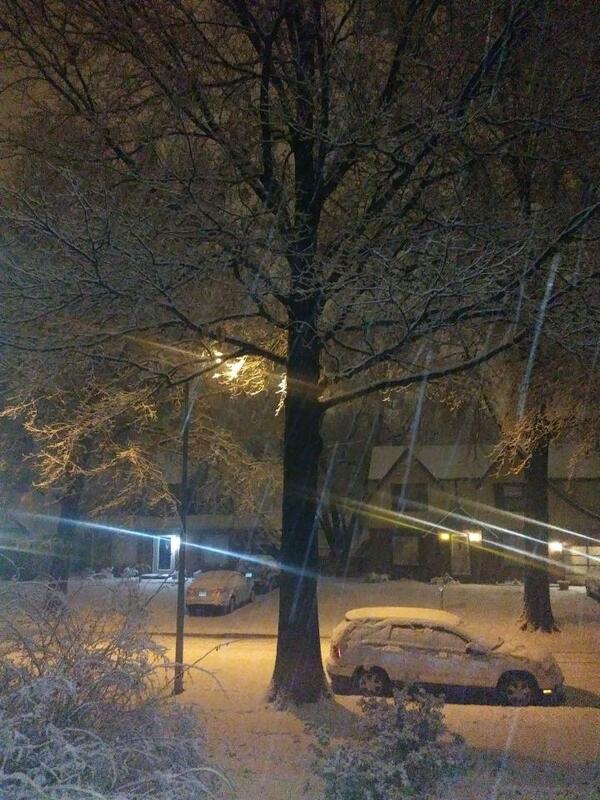 It kept lightly snowing. Two guys came by and offered to shovel our sidewalk for ten dollars. We said okay. Only the front bushes were so heavy with snow, they bowed over the sidewalk making any walking passage or shoveling impossible. So the guys shoveled a bit along the driveway and the front piece of sidewalk. As if that would make any difference. 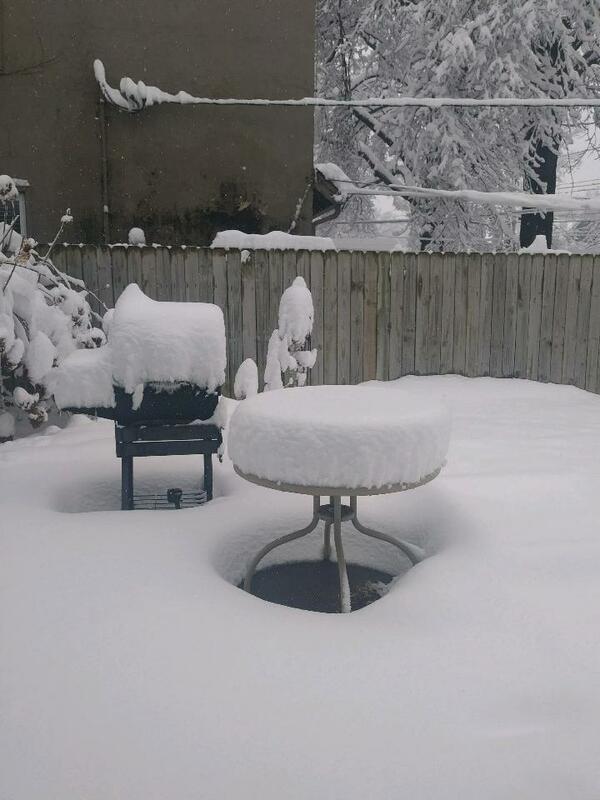 Cliff took a photo of the back patio before he waded out to measure: 12″ of snow. That’s a lot of snow. The sky stayed cloudy and the snow stopped. So did the cable television and the electricity. We built another fire and turned on the gas stove to warm up the place. But first we had to remember how to light said stove since it has electric sparks that catch the gas. Ah, yes. Use a striker. It worked. We did not, however turn on the oven as we couldn’t figure out a way to do that without exploding the place. But being a farmer’s daughter, I put pots of water on the stove top burners and kept them steaming. It helped a little. We managed to feed ourselves although I can’t remember what we ate. No doubt something simple. Cliff kept putting logs on the fire. I stayed wrapped in a blanket and slept in my clothes that night because I couldn’t face getting undressed. This was the thump in the night. 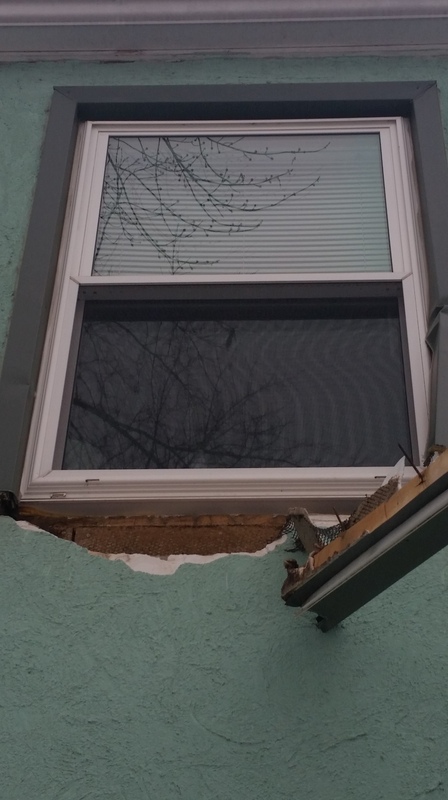 Snow had pulled wires loose and along with the wire, the window sill and the window covering around it. You can see in a previous photo how the willow was bending over wires from the weight of snow. Why anyone would attach a cable to a vinyl window covering is beyond me, but they had. And the weight of 12″ of snow on our graceful and beautiful willow had weighted them down. With the wires. At some point Sunday mid-morning. electricity came back on and the furnace and the hot water. We, husband, son, and mom, took showers and went to a neighborhood diner for breakfast. Monday, I began the task of calling insurance company and contractors. We’d also developed a leak in the upstairs ceiling, so son and I climbed into attic, spread out some big garbage bags and stationed pots and buckets under the leak. The following days/weeks passed in a blur. An insurance adjuster called, said he’d be in the next day and would call to set up an appointment, but as he was in Wisconsin and a big storm passed through there after here, I don’t know if he came…or was perhaps sent out somewhere else. Many people had a lot more damage than we did. I called the cable folk and asked someone to come out and reattach the cable; called the electric folk and they put a “temporary” (whatever that means) re-connection to the electrical wires. Called the electric installers and they came out and gave an estimate for repairs. You may remember the rambling post I made about having our entire house rewired. Well. One of the things pulled loose and damaged was the new tubing and weather cap around the new KCPL wire running into the new KCPL box. And if the weather cap leaked, the water could not only short out the KCPL box, but also the new panel in the basement. My son who knows these things, once being an electrician, went out and saran-wrapped the weather head back on the pipe, thus sealing the house against another catastrophe with wiring. The company who installed the electricity gave me a $1500 estimate for full repairs and re-connection. I also now have a contractor who will come out, replace the window ledge and repair the stucco, and the window company who will come out and re-wrap the window once the stucco is done. Downside: the stucco can’t be done until the weather warms up. And I’ve engaged a roofer who will come out and re-roof, but again, not until it’s warmer. I have yet to see an adjuster. The insurance company calls from time to time, but there’s been so much damage to so many houses, not just in Kansas City, but across most of the Midwest, and especially after this latest storm which largely left us untouched, that I expect we may boggle along this way until spring. The cable person re-attached the downed cable to a spot above the window, hopefully he found a stud, there must be sturdy studs in 1924 built houses, and maybe especially in 1924 built houses, and my son leaned out the top window with his trusty wire cutters and released the mesh wires (mesh wire holds the stucco in place) attached to said window ledge, so it dropped to the ground and is no longer banging against the house. And we, meaning my son using the chain saw and Cliff and me trundling cut up branches to the front curb, severely trimmed the damaged willow much to my sadness. I planted that willow as a baby 9 feet tall, and it now reaches some 35 or so feet. The bees love it in the spring when it buds. I will give it generous food stakes once the weather turns warm. One of my monarch butterfly bushes is damaged and another, in a trellis, is leaning on its side. It’s Imbolc, the festival of light, midway between winter solstice and spring equinox. The sun returns (yes, Rose, I know you don’t see that rising and falling sun much where you live) and the groundhog, oddly enough, didn’t see its shadow this year. We pray for an early spring. Light a few candles. It’s not been an easy winter for many. Rejoice in the light. I was somewhat surprised to see my last post was in early October. In thinking back to October and November, oh, and also December, and which, in the case of memory, is an iffy project, I have no idea what’s happened. I know I’ve been culling books and have taken three trips to Half-Price Books to unload extraneous volumes from our voluminous bookshelves; we bought a tree and decorated it; however, a small tree as I wasn’t up to the whole take-out-years-of-ornaments and hang thing this year. And I’ve written and sent book proposals to two reputable publishing houses after my several-month search for an agent proved fruitless. Oddly enough, when I’m writing, I’m able to focus and thoughts and to-dos don’t go dashing through my head. Having kept up with journal posts, I could dig them out and see what I did when. Or if. Nothing very remarkable as near as I can remember. But then, as I said, memory is not one of those things that’s working well these days. For a while, my husband worried I was developing dementia. Well. Being demented comes in all sorts of ways. Demented I can agree to, but I don’t have dementia. Just a rattled head with thoughts dashing past that if I don’t note down on the copious bits and pieces of note pads stacked around, I can’t remember. But I’m not repeating myself, although that might actually help me stay more or less on track. This, too, shall pass. We hope. However, many of the big and slow moving planets are not going to move out of the picture soon. When you think about it, however, even in bits and pieces that refuse to stay connected, one can easily see this year, in particular, has been, well, odd is perhaps a non-judgmental way to put it. Nuts is another. However, the furnace is keeping us warm; we have a supply of wood for fireplace evenings; the Christmas Eve and Christmas Day dinners are planned and shopped for (yes, we have two festive meals) and for the most part the to-dos are done. Now it’s time to open the wine. So here’s to you my online friends. 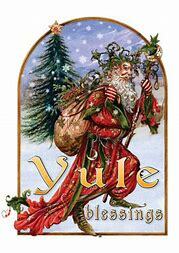 May your new year bring you joy, healing, and great bouts of laughter. Thank you for being in my life and bringing your life to mine through your words. Even when I don’t respond, I do read your posts. So, thank you, again. V.S. Naipaul, the Trinidad-born Nobel laureate whose celebrated writing and brittle, provocative personality drew admiration and revulsion in equal measures, died Saturday at his London home, his family said. He was 85. With those few words, images and memories flooded my mind. It’s about 1980 and I attended my first writers’ conference, AAPP, in San Antonio with another writer friend, Bill. He knew many of the men there and our table crowded with them, telling alcohol-induced stories, one over the other, laughter rolling through the air with whorls of cigarette smoke. V.S. Naipaul one of them. A slew of well-known writers, one particularly, whose name I can’t recall, but a great bear of a man whom I coaxed onto the dance floor. He danced like a bear, but a laughing bear. Naipaul was quieter. At one point, I found myself sitting beside him, and he told me stories of Trinidad in a quiet voice, almost as if they were painful to recall. What I remember most was his beautiful accent, an island patois varnished and overlaid by proper British English. Perhaps only patois could bring back the island stories, complete and whole again. I never heard brittleness in his voice. Sadness, yes, it showed up in his writing, too. Perhaps the brittleness was reserved for his battles with the world. Some months later, maybe close to a year later, I saw him again at a conference in Connecticut. We walked the grounds and talked. I suppose if I dug through my journals of that time, I could find details of what we talked about. Mostly writing, I expect, and the demands of that life. The Connecticut trip was the impetus for my move to New York City later that year. Naipaul and I kept in touch by mail for a few years, but then he moved or I moved or maybe both, and we lost touch. That was about the time I went to Mexico to live. As I’m a letter-saver, somewhere in my cavernous files there may yet lie one of his. I suppose this is now the part of life I’ve come to–the part where old friends and acquaintances die, and unless he or she is famous or a family member, often I don’t know. They lie in my past, still alive, still telling me stories when I run across a letter or an old piece of writing, or even, on those few occasions, when I see a newspaper story. And for that I am grateful. It brings a patch of my own life back in focus, and I smile as I tell a story for someone else to remember. I said goodbye to an old friend, today. A loyal friend for nearly thirty years, through moves and changes and chaos. Old Friend has just kept being there for me and kept working. This is its story. In 1990, after three years of living in Mexico, I returned to the United States and moved to Washington D.C. My son, Stephen, was living there, too, which made the move easier. After renting a studio apartment off DuPont Circle, I retrieved my life in storage and set up a home. While I had a lot of books, I did not have a bookcase, so Stephen, being a tool man, build a sturdy one, 3 1/2′ x 6′, with copious room for my copious books, and with a gap in the middle of about 20″, which he filled with the Orion television for my birthday. When I moved to Santa Fe three years later, I moved both television and bookcase and set up housekeeping in a 600 sq. foot adobe in Seton Village outside the city. Miraculously, the bookcase fit between the front door and the steps down to the kitchen. I stayed in Santa Fe for five years. A record from my usual three years here and then move pattern. After Santa Fe, I came to Kansas City, Cliff and I bought a house, and the Orion went on the same bookshelf in the large bedroom which also serves as my workout room. A year later, Stephen moved here. 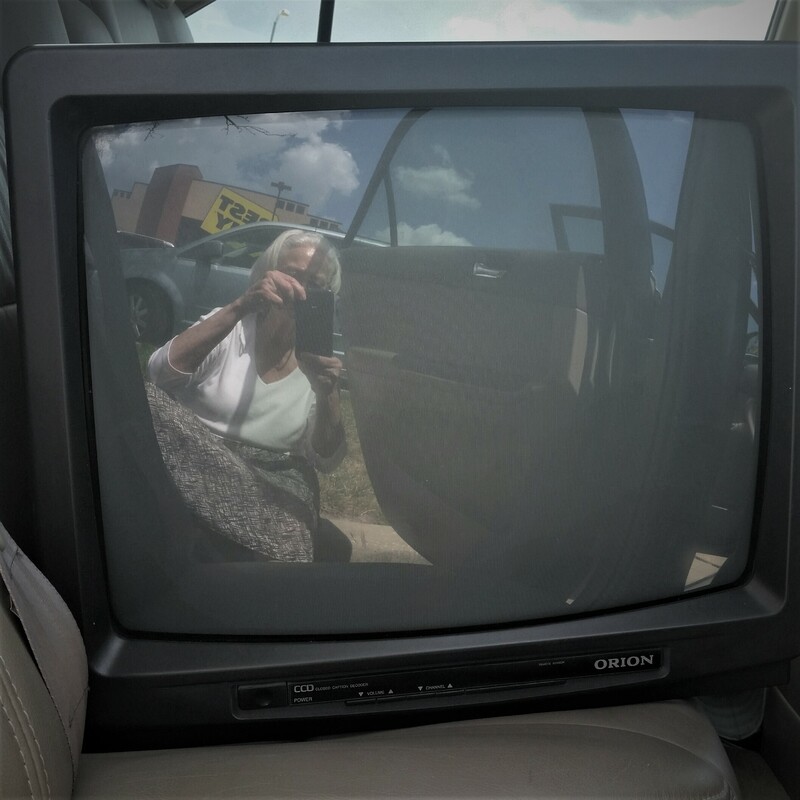 By that time, we’d dispensed with the rabbit ears, hooked up cable, and attached a video player for the years of saved workout videos I own…which, as a matter of convenience, are also stored on the bookcase. We have, in fact, years of movie and workout videos. A VCR, even in this day and age, is valuable. And now we come to this summer’s birthday. I came home from some errand or another and went to the bedroom to change clothes, only to discover a new 19″ flat screen sitting where the old Orion used to sit. Stephen had once more bought a television for my birthday. The new flat screen came with a new remote, which I also had to learn, but that’s another story. It has taken a month for me to release the old television, however. It sat in my writing room, until today, we finally carried it to Best Buy for recycling. You see, that Orion held stories–Stephen and me watching t.v. as we ate a meal together at my little studio apartment in D.C.; watching “Nothing Sacred” with Cliff in the adobe, a favorite television show, alas no longer with us, either, as we snatched a quick dinner before evening services. Me sitting in front of the television one year, crocheting stars for Christmas ornaments, fire in the fireplace, which ornaments I sent out to family and to my best friend, Cynthia, who is no longer with us. The Orion was part of that history. We moved the Orion out to the back seat of the car. I kept trying to give it away; although it still worked, no one wanted it. I could not just trash it. So we drove to Best Buy, turned the Orion to face me, and I took our picture. Together, one last time. Since some were unable to read from the electronic version of Still Point, here’s the essay. You might, however, want to go in and look at the visuals. The editor, Christine Cote, does a remarkable job. Solitary and lonely are not the same although often confused. It is possible to be lonely when one is solitary, but it’s also possible to be un-lonely, in other words, content. A loner, perhaps one could say. I grew up in an old and solitary farmhouse on the Great Plains of Kansas with five siblings, two parents, and a grandfather. That’s hardly a lonely life. And yet, as I look back at my childhood, I see myself solitary, wandering pastures, or out on a tractor, alone, plowing a field. Being left-handed and a dreamer, my solitary times often included falling over or off, in one way or another, and once tangling a plow in the fence and tipping both plow and tractor. Those sorts of tasks rarely meshed well with solitary dreamer. Sitting by a window, staring at our backyard’s willow, the small fountain, the grass, or up on the farm, which we yet own, and staring out over the tallgrass prairie, works well for me. I’m reminded of the joy Thomas Merton took in his solitude: But my chief joy is to escape to the attic of the garden house and the little broken window that looks out over the valley. There in the silence I love the green grass. Of all the things Merton knew and taught and wrote, solitude was the breath in his life. Some of the earliest stories about me, from when we lived on a farm in Arkansas before we moved to the Kansas farm, tell of my wandering spirit, especially when I’d go visit Miz McNeil who lived on the farm next to ours. We left Arkansas sometime around my fourth birthday, so my wandering habit began early. Miz McNeil grew peanuts. I loved peanuts—for that matter, still do—and Miz McNeil fed me peanuts when I visited. Peanuts roasted or boiled in the shell. One day, she decided to send me home with a supply, so she levered peanuts into my pockets; however, I had holes in my pockets, and do to this day from jamming my hands in too fast too often. The peanuts went into my pockets and out the holes and down my legs to shower around my feet. Miz McNeil, clever woman, tied strings around the bottom of my pants legs and kept filling my pockets with peanuts until both pant legs were filled. Probably laughing as she did so. I waddled home. These were roasted in the shell peanuts, if you’re wondering, as boiled peanuts can get soggy. On the Kansas farm, across the field west from the house, I’d wander down to the spring where Dad’s Uncle August and Uncle Louie once built a still. Three stone walls were all that remained. But the spring was there, and a pipe, pushed by an unknown hand into the bank at water’s edge, poured cold fresh water into my cupped hands. Matted pads of watercress grew in the pools between rocks. I carried a plastic bag in my pants pocket for those trips. If I brought home fresh watercress for Dad, he forgave my absence from whatever work was going on. I learned to watch the sky from those wanderings, and the way light shifts and slides over a wheat field ruffled by wind. Annie Dillard says it best: There is a muscular energy in sunlight corresponding to the spiritual energy of wind. When thunderheads piled at the horizon and the light turned thick and coarse, it was time to head up the hill to shelter in the safety of family and house as the energy could turn wicked and threaten in the space of moments. Solitude becomes more pricey in a city, but it’s possible. When I lived in New York, I had a small apartment on the second floor of a brownstone on West 85th Street. With windows. I’d sit with my first coffee as early sunlight tipped over the edge of the women’s residence across the street. The building, while long, was no more than three stories, and I’d watch from my solitary perch as women left in summer dresses, unencumbered, or in fall’s blustery wind, umbrellas tucked under arms. One morning, a fierce storm tossed the branches of a small tree growing in a small patch of earth at the sidewalk’s edge. The tree survived the storm, but trashcans were tossed into the street. Trashcans in New York lead perilous lives. Poets know solitude and weather: The four elements doze and wake./Who knows, behind the dark cloud/a small star may be playing. Adam Zagajewski. I met him once, at a reading, in a press of people and space. No time for anything but a thank you. He was kind. He signed his book for me. But I have his wanderings and his words for company. Zagajewski liked walking in cities, too. I lived a half-block from West End park so could walk solitary among trees, but walking the sidewalks, pausing to look up at glowering gargoyles perched on ledges as people-streams sloshed around me, was just as alone. It’s easy to feel alone in a city. The iconic painting, Nighthawks, by Edward Hopper shows it. A couple sits at the coffee bar, not looking at each other, a single man sits apart, his back to us, and the barista bends over an invisible sink. But I prefer walking country roads. The only thing to watch for is a blacksnake, its head lifted on a twig, sunning. Blacksnakes, our dad taught us, are a farmer’s friend. They eat rats. On a country road, I can allow my thoughts to wander in time to my steps. I watch for the red-winged blackbirds crossing my path, for the meadowlarks skittering away in the prairie, for the white-faced cows, lifting their heads from grazing to look at me, curious. I watch the sky and the light to know when it’s time to turn back.